Appearing before the Martha’s Vineyard Commission (MVC) for the second time in two weeks, developer Sam Dunn attempted the regulatory equivalent of bowling’s 7-10 split. At a packed public hearing ON February 20, Mr. Dunn attempted to mollify critics of the bowling alley/entertainment center he proposes to build in Oak Bluffs and respond to commission member questions and concerns on a range of topics, from parking to trees to bowling pin noise. The bowling alley would be located on Uncas Avenue at the edge of the town’s business district. The proposal includes 10 bowling lanes, a bar, a restaurant, two golf simulators, a game room, an event room, and two apartments that would qualify as affordable housing. Mr. Dunn estimates the cost of construction at $2.5 million. 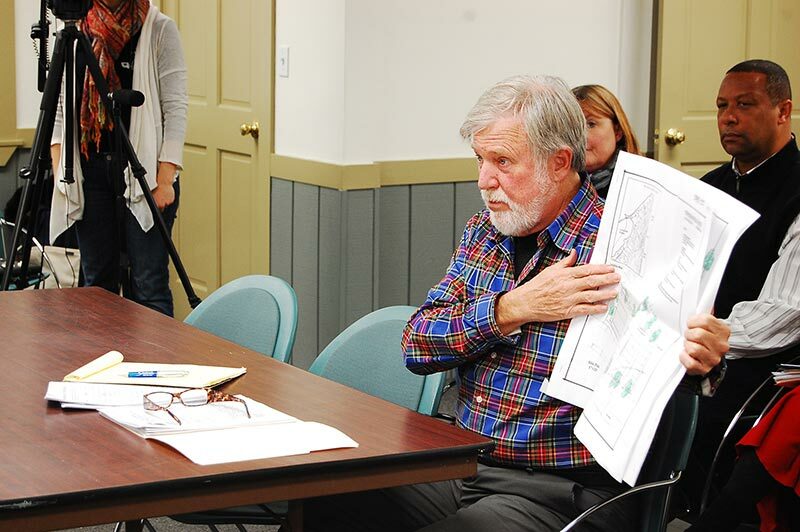 Mr. Dunn first presented his plan to Oak Bluffs selectmen on October 22. The planning board unanimously approved the plan on January 23 and referred it to the MVC as a development of regional impact (DRI), as required by several triggers in the project, including size. After his first appearance before the MVC on February 6, the commission asked Mr. Dunn for an independent acoustic study to more exactly determine potential sound levels to abutters. He was also asked to be more specific about the number of events he would allow during the summer months and describe how he would mitigate potential odors from the kitchen. The commission also determined a new traffic impact assessment would be necessary to better reflect seasonal fluctuation. There were also waste water concerns and, since part of the property was once a gas station, concerns about contaminated soil and groundwater on the property. He was also asked to consider providing a police detail for closing hours. In a brief conversation Friday, Mr. Dunn, an experienced developer, expressed weariness with the demands of the MVC hearing process. Mr. Dunn noted that he had provided additional studies on top of earlier studies, modified his project and cleared the project with the state Department of Environmental Protection (DEP). The MVC land use planning committee (LUPC) will meet on March 3 to discuss the project and forward recommendations to the full commission which will next take up the project on March 6 for an expected vote. The MVC could approve the project, approve it with conditions, or reject it. The MVC will accept public comment until 5 pm, February 27. On Thursday, noise was again a focus of discussion. Mr. Dunn enlisted acoustical consultants Cavanaugh Tocci Associates to provide the requested acoustical study. MVC DRI director Paul Foley noted this was the same firm that developed the successful sound mitigation protocol for Dreamland after abutters had expressed similar concerns. The consultants recommended upgrading construction of the south and west walls and the west side of the bowling alley roof. “Based on analysis so far, [we] think that the bowling sounds can be mitigated to a level that is inaudible at most times,” the report concluded. Commissioner Joan Malkin of Chilmark, a lawyer, said the definition of “inaudible” needed to be more precise. MVC hearing chairman Linda Sibley of West Tisbury expressed similar doubt and asked for more specificity than “at most times.” She also asked for more information. “It would be nice to know what the decibel level is when everybody throws their balls at once and all the pins are hit at once,” she said. Commissioner Kathy Newman of Aquinnah, who at the first hearing questioned if the pins could be made of a sound dampening material, asked about the noise level when the doors are open. Mr. Dunn replied that there are no doors on the side of the building that abuts the objecting residents. Mr. Dunn also agreed to a stipulation that there would be no amplified loud music and that signs would be posted at the exits asking patrons to be respectful of the neighbors. Mr. Dunn estimates the additional soundproofing will cost roughly $25,000. The site plan calls for honey locust trees to be planted on the property border. That caught the attention of Ms. Sibley. Ms. Sibley suggested Mr. Dunn consider Waxberry bushes or another native species as an alternative. Asked to further define the number of events that would be held in the function room during the summer, Mr. Dunn said there would be no more than two events per week during the summer, of no more than 50 people. Mr. Dunn defined the summer as June 15 to September 15. Once again, commissioners pressed Mr. Dunn on an exact closing time. According to town bylaws, if the project is granted a liquor license, it would be allowed to serve alcohol until 1 am, seven days a week. Mr. Dunn previously volunteered to make last call at 10:30 pm on weekdays and 11:30 pm on Fridays and Saturdays. “This still leaves us no indication of when patrons would be leaving,” commissioner John Breckenridge of Oak Bluffs said. Mr. Dunn said he was willing to stipulate that people would not be served more than one drink per patron at last call. Mr. Breckenridge said that under those rules, someone could stay until 4 am. At the February 6 hearing, the majority of public comments came from owners of abutting residential properties who opposed the project, citing noise, traffic impact, and the rowdiness that could result from having a full bar in the proposed building. Once again, abutters, joined by selectman Gail Barmakian, who also opposes the project, turned out to state their objections. However, unlike the February 6 hearing, proponents of the project were in the vocal majority and they traded points. John Tiernan, co-owner of the Dockside Inn in Oak Bluffs, asked the MVC to consider the needs of year-round Islanders and the lack of recreational family venues in the off season. Mr. Tiernan also said that the estimated eight full-time jobs and 20 part-time jobs would be an asset to the town, in addition to the recreational activities. Ann Smith, director of Featherstone for the Arts, expressed full support for this project. “Oak Bluffs is in trouble and anything that promotes good business in B-1 district is good for this town,” she said. Mr. Joyce countered that the church was clearly in a residential district. Mr. Dunn’s project is not.